Successfully Added High Resolution Digital Camcorder + 3x Optical Zoom - 3 Inch TFT to your Shopping Cart. High Resolution Digital Camcorder + 3x Optical Zoom - 3 Inch TFT. 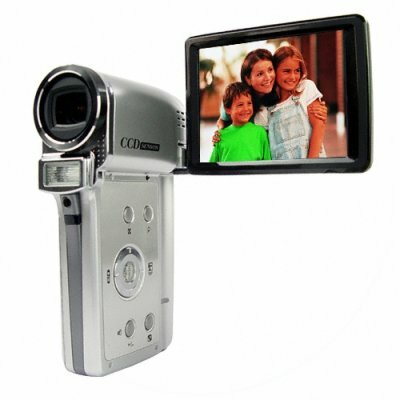 This modern digital camcorder will amaze everyone, with a large TFT LCD swivel screen and variety recording options. This unit uses a very impressive 7MP CCD sensor to provide vivid video at 720 x 480 and excellent photos at up to 12 MP (with interpolation). The swivel screen folds out from the camera and can then rotate through 270 degrees to provide excellent capture and playback options. When not in use the screen is protected by being folded in alongside the camera assembly. With the ability to extend the cameras memory out to 4GB with the SD card slot you'll have plenty of space. This excellent camera is rounded off with a comprehensive English manual and intuitive controls including fold out screen power On / fold in screen power off. Get one now from Chinavasion for yourself or start selling to eBay customers direct using Chinavasion's reliable drop shipping service.